OVERLAND PARK, Kan. (Feb. 2, 2016) – The National Operating Committee on Standards for Athletic Equipment (NOCSAE) discussed a number of topics to advance athletic equipment safety at its standards meeting in Phoenix on January 29, including introducing the world’s first chest protector performance standard for commotio cordis, and advancing football helmet standards to address concussion risks and youth provisions. NOCSAE introduced the world’s first performance standard for chest protectors for commotio cordis and moved it to proposed status at NOCSAE’s standards meeting on January 29. Commotio cordis, a heart rhythm disruption caused by a blow to the chest, is one of the leading causes of sudden cardiac death in athletes. In conjunction with research efforts by the Louis J. Acompora Memorial Foundation, NOCSAE has funded more than $1.1 million in research to help identify the specific cause of commotio cordis and to develop a chest protector standard designed to significantly reduce the likelihood of occurrence. The new NOCSAE standard applies to baseball and lacrosse, where catchers and goalies are typically the most vulnerable to commotio cordis. Approximately five to 15 athletes die every year from this syndrome. Most of these deaths are males under the age of 14 who are often wearing chest protection. The NOCSAE board of directors voted to advance the chest protector standard for commotio cordis to proposed status, meaning the standard will remain open for public comment until January 2017, at which time it will be eligible to be voted on as a final standard unless modifications are recommended. During the January 2016 meeting, the NOCSAE Standards Committee Consensus Body voted to move its proposed pneumatic ram test standard to final status. This standard includes new tests that create and measure rotational accelerations, a crucial first step in improving the ability of helmets to address the risk of concussion. 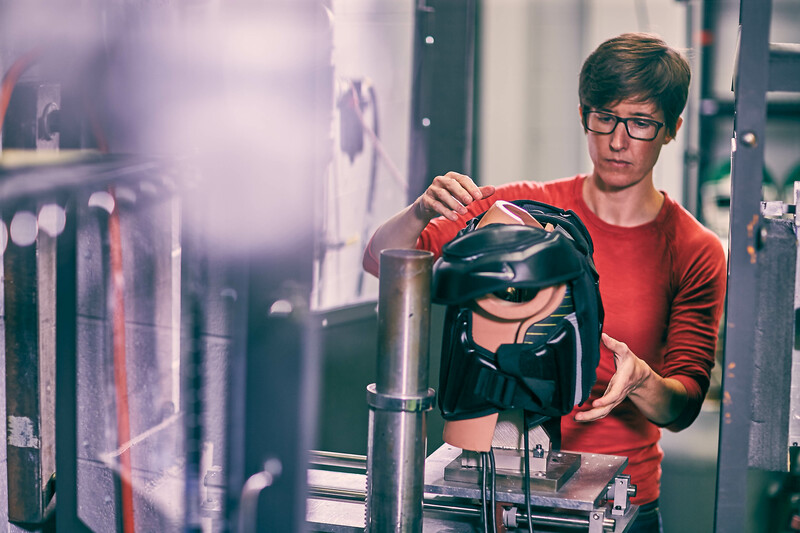 NOCSAE is working to revise its football helmet standard to incorporate the pneumatic ram test for rotational accelerations. NOCSAE received significant public comment on the existing proposed changes to the football helmet standard. In response, a new proposed football helmet standard was approved at the January 2016 meeting. The new proposed football helmet standard incorporates rotational accelerations in the pass/fail specifications, and includes provisions for adjusted pneumatic ram impact velocities for helmets that manufacturers label as youth helmets. In January 2015, NOCSAE began requiring ISO/IEC 17065 accredited third-party certification for athletic equipment to meet NOCSAE standards. Under this requirement, a manufacturer contracts with an independent certifying body, Safety Equipment Institute (“SEI”), to audit their procedures and quality programs, and test, validate and certify their athletic equipment to meet NOCSAE standards. Over the course of 2015, the transition to third-party certification was staggered based on manufacturers’ sport-specific production seasons for equipment. As of February 1, 2016, all third-party certification for athletic equipment has been implemented. NOCSAE voted to move several proposed standards to final status, including standards for field hockey headgear and balls, and revisions to NOCSAE’s corrosion testing standard. Additionally, a proposed lacrosse headgear standard is now available for review at www.nocsae.org.